Learn the Fixation of distal third humeral shaft fracture using Synthes LCP extra-articular distal humeral plate surgical technique with step by step instructions on OrthOracle. 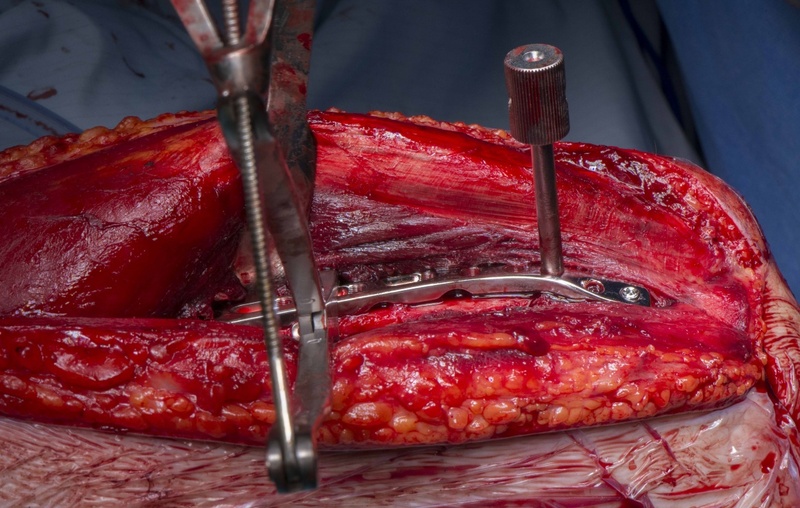 Our e-learning platform contains high resolution images and a certified CME of the Fixation of distal third humeral shaft fracture using Synthes LCP extra-articular distal humeral plate surgical procedure. Using a plate remains the commonest method of internal fixation used for those humeral shaft fractures which require surgical treatment. The location of the fracture determines both the approach and also the type of plate to be used. For a distal third humeral shaft fracture my preference for using the Synthes extra-articular distal humeral plate stems from the need for adequate fixation. Due to the anatomical shape of the distal humerus this can be difficult to achieve with plates that are not designed for the area. The fracture characteristics and level of the fracture determines the type of plate required but irrespective the principle of having six to eight cortices of hold either side of the fracture is adhered to. For fractures in this region, a standard LCP plate would not normally allow adequate fixation of the distal fragment as it encroaches on the olecranon fossa and can therefore inhibit elbow extension. The design of the Synthes LCP extra-articular distal humeral plate plate however allows fixation distally along the dorsal aspect of the lateral column, leaving the olecranon fossa clear. The plate is also sufficiently robust to allow fixation using a single implant, thus reducing both operating time and extent of exposure. Author : Mr Samuel Chan FRCS (Tr & Orth). Institution :The Queen Elizabeth Hospital, Birmingham, UK.